Referring to Philpott as 'young' is not meant to be patronizing. The orchestra of which he was, at least at the time of the recording, first trumpeter is unusual. 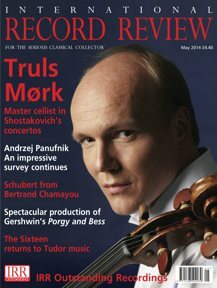 The European Union Baroque Orchestra, as its booklet biography advises, auditions and selects completely new young Baroque musicians every year. Its regular director is the Danish harpsichordist Lars Ulrik Mortensen, but EUBO also plays under many distinguished guest directors. So to be precise, the orchestra playing on this recording of a live concert from St John's, Smith Square in September last year is EUBO 2013. Philpott is one of the UK representatives in the orchestra and, in a nice touch, the nationality of all its members is listed in the booklet. The leader of the orchestra, for example, is the Bulgarian Baroque violinist Zefira Valova. Potter's sensitive, accomplished singing and the skilful playing of this extraordinary pan‑European orchestra are the real strengths of the recording. Unfortunately, not all aspects of it are as successful. Handel's Coronation Anthems are, unlike the Queen Anne ode, among his best known and beloved compositions. For a recording to make an impression with these works it will need to have some world‑class choral singing. On the evidence of these performances, at least, the mixed‑voice choir of Clare College, Cambridge, is simply not in the same league as the best of the Oxbridge boys' choirs. The disc opens with the most famous of them all, 'Zadok the Priest'. 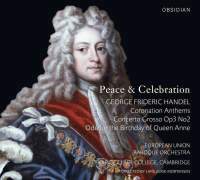 Handel's marvellous teasing, tension‑building orchestral introduction is well played by EUBO 2013, but as soon as the choir makes its explosive entry disappointment sets in. The choral timbre here and throughout the recording is thick and glutinous; whereas a lean, nimble sound is required. The choir lacks focus and precision ‑ problems caused, or at least exacerbated, by distinct wobble from some quarters (notably the altos). Comparison with the acclaimed recording of the Coronation Anthems with the Choir of New College, Oxford and The King's Consort makes the Clare College account rather dispiriting listening ‑ even making allowance for the fact that this is a live recording. As noted, the Ode for the Birthday of Queen Anne is a very interesting work even beyond its celebrated opening movement. It has a good mix of delightful arias, ducts and choruses; but I regret to say I shall now track down a better recording. The fine contribution of Potter aside, the kindest thing to say about the solo singers, all drawn from the choir, is that they are of variable quality. One or two are more than acceptable; others are not really of a standard suitable for a commercial recording. To end on a more positive note: EUBO 2013 gives an infectiously joyful performance of the irresistible Concerto grosso, Op. 3 No. 1. Kudos in particular to the oboist (presumably Ciara Geuchen) and the two cellists, Guillermo Turina Serrano and Nicola Paoli, for a ravishing performance of the 'Largo'. (Surely the loveliest movement in all Handel's Concerti grossi.) It was heartening to hear these young musicians play with such style and confidence. It augurs well for the future of Baroque music‑making in Europe.